Snobelle wondering how to get some of that grain. Hercules is more interested in the alfalfa. 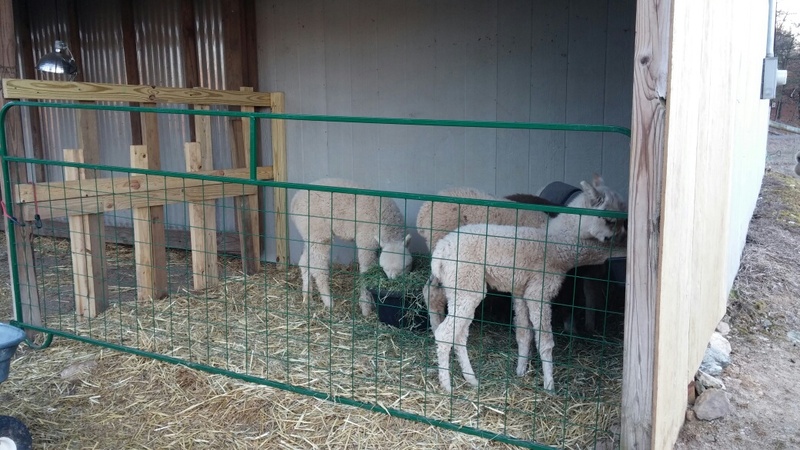 We had an overhang area that we just closed in the end to block the wind, and looking at it gave me an idea of how to separate the space so the crias could get in to eat hay. 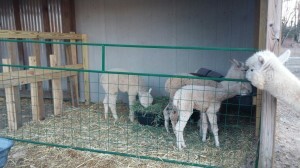 The crias are all one to three months, so they are not close to weaning yet, and are all very dependent on their moms. They are not looking for an area of independence as much as with our previous area, just a space to eat at their speed. So, I decided on a gate similar to our previous feeder with a movable panel across the front of the barn to allow us access to bring in the hay. 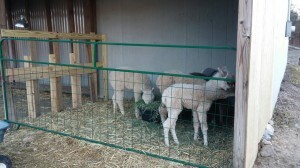 We trained them the same way as previously by placing them in the feed area to familiarize them with it. The crias loved it! Marquessa is trying to come up with a new strategy for getting into the creep feeder area. Unfortunately so did one of the moms. Marquessa is not only lovely, she is smart. She quickly realized that the 26 inch by 12 inch openings we made were quite big enough for her to squeeze through. So I added another board to lower the height to 22 inches tall. No problem. Marquessa is fine with crouching and walking on her knees to get some extra alfalfa. So I added a 2 inch board along the edge. You guessed it. No problem for Marquessa. Hold your breath and work through it. Finally, I added another 2×4, reducing the opening to 8-9 inches. The opening was now so small we worried the crias couldn’t fit, but they are actually quite tiny still and fit through with no trouble. Marquessa is put out, but she’s got plenty to eat in the mamas’ hay feeder. 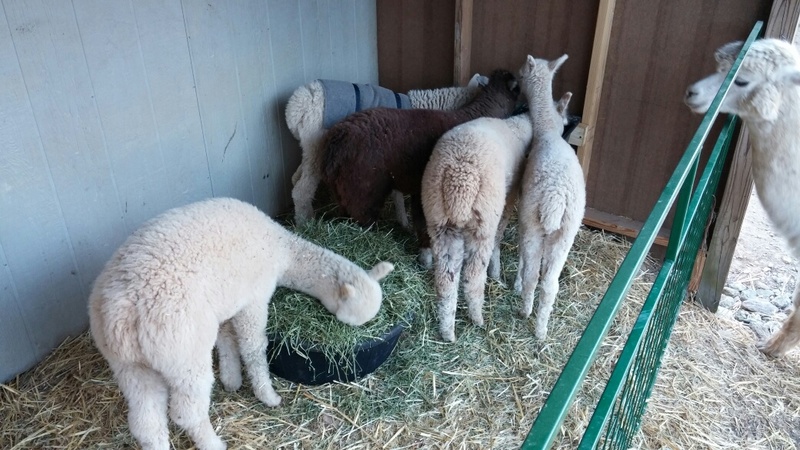 I noticed this week that several of the fall crias were showing a lot of interest in their mom’s grain as well, so added a feeding bar and a couple buckets to the alpaca cria creep feeder area. 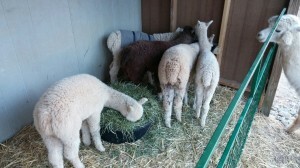 That was a hit with the crias, even little Chrissy, so I will likely add a few more buckets so they don’t have to jostle each other to eat. We expect this to help keep the crias weight gain going strong, while reducing some of the energy demands on their moms as well. 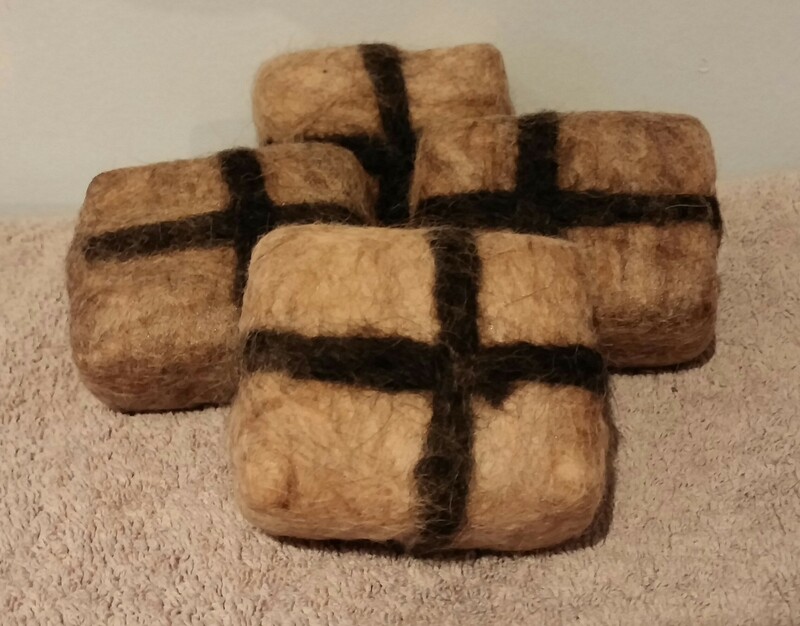 We have our alpaca dryer balls and felted soaps back in stock in the store and online. We sold out before Christmas and are happy to say that we have finally had a chance to make up some new dryer balls and soap. You can see them here, along with other items made on the farm. 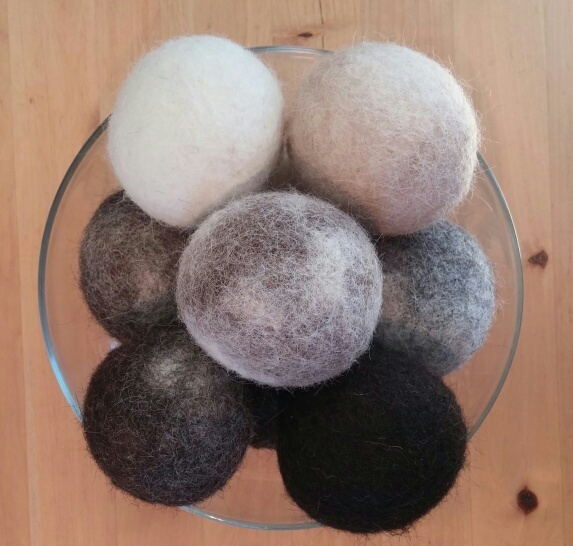 You can also read about how we make our felted alpaca dryer balls here.